Ultra Strike is a somewhat revolutionary Plating procedure. 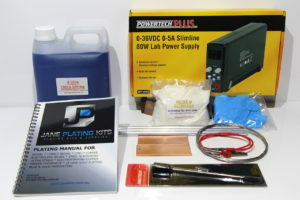 It allows you to electroplate metals that were previously unable to be plated successfully. Once plated with Ultra Strike your parts can then be plated with other decorative finishes such as Zinc, Nickel or Electroless Nickel etc. The Ultra Strike Plating procedure is primarily used as a strike to enable a conductive surface to be applied to a non-conductive metal. The Ultra Strike plating result is not designed as a finish plating coverage. It is designed as a strike only and a further finish of Nickel, Zinc etcetera is generally applied over the top of the Ultra Strike. Plating non-conductive surfaces can be problematic. Awkward shaped objects can prove difficult to prepare. Also, some pot metals can be high in carbon content. These potential issues may affect successful adhesion. Ultra Strike is designed to plate directly onto steel, copper, brass, stainless steel, zincated aluminum, electroless nickel, nickel as well as die cast zinc surfaces without a separate strike. 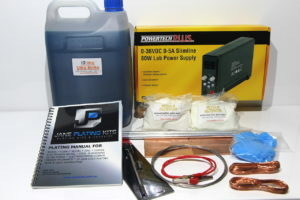 Ultra Strike is a non-cyanide alkaline copper plating. It produces a fine grained, smooth, dense and ductile copper plate that is used as a strike coating only. It is a liquid concentrate and comes to you in containers with various chemicals that are pre-mixed. The pre-mixed contents will need to be mixed with water at a ratio of 1 to 1. The Ultra Strike electrolyte or chemical needs to be at an optimum temperature for successful plating. The ideal temperature is 40 to 55 degrees Celsius. This means you will need to heat your Ultra Strike chemical. The best way to achieve this is by placing your chemical into a stainless steel container and externally heating it with a naked flame. (Small gas portable camping stove is ideal). The temperature needs to stay within this range. A thermometer is included in the Kit to manage this. The Ultra Strike contents you receive will be in container/s. It has various chemicals mixed together and the entire contents should be mixed with water at a ratio of 1 to 1. Therefore if you have ordered a 4 Litre mix, you will receive a 2 Litre bottle of chemicals that should be mixed with 2 Litres of water. Copper anodes are supplied to be used in the Ultra Strike plating bath. The anodes are high grade flat bar type anodes and are drilled so as they can be hung on stainless wire in the bath. The Copper anodes hanging in the plating bath are the source of the copper metal that will be plated on to your work hanging in the plating electrolyte. The minute ions of copper metal are transferred on to the work in the bath by the system of electrolysis. The anodes are approx. 100 mm. x 40 mm. 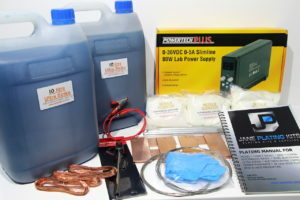 For the 4 litre Ultra Strike Kit 2 anodes are supplied, 4 anodes are supplied for a 10 litre kit. Use them all and hang them either side of your plating. For larger kits, the number of anodes supplied depends on the size of the bath. The copper anodes are soluble to the copper electrolyte and must not be left in an idle bath when there is no plating taking place. Note Before attempting to plate your items first you have to activate in METEX M activator. METEX M is an acid salt that is mixed with water. Your parts have to be completely clean prior to this activation and is a process done immediately prior to the Ultra Strike Plating. After immersion in the Metex solution a clean water rinse is required before placing into bath.